Recently, one of my children was suffering from a stomachache. Without a second thought, I went to the medicine cabinet and reached for the Pepto-Bismol. As part of the usual kid-versus-parent battle that ensued, I told that her that I had been taking this medicine since I was a little kid. That got me wondering: just how long has Pepto Bismol been around? Turns out, much longer than I realized. This product was introduced in 1901 and branded Pepto-Bismol in 1919. The basic formula is sold under other names, but it’s the Pepto-Bismol brand that is firmly ingrained in consumers’ minds. Ford – Founded in 1903 and still the most successful American auto company. Ford has survived increased international competition and domestic economic recessions. Coca-Cola – Started in 1886 and positioned as a medical elixir, this product is still hugely popular and sold in over 200 countries. Hershey – Came into existence in 1894 and is the oldest and largest chocolate manufacturer in the U.S. While the company has introduced new products, the Hershey bar is still the most popular choice and has stayed basically the same over the years. Kellogg’s – Began in 1906 and is the largest provider of cereals in the world. Heineken – Introduced in the Netherlands in 1873, the company owns 119 different breweries and sells product in 65 countries. In spite of the brand’s age, it is often thought of as a “hip beer choice” here in the U.S. Think about all the change the world has seen since these brands were developed – political, social, and economic. It is mind-boggling. And yet, not only have these brands survived, they’ve thrived. There is much conversation about which characteristics contribute to a brand’s success and longevity, but three that emerge frequently are passion, consistency, and company leadership. What brands will our children take for granted as having been around forever – Apple, Nike, McDonalds? Time will tell. Here at d.trio, we are fortunate to have the ability to work remotely when necessary. We have an excellent array of technology tools that allow us to service our clients without skipping a beat. In fact, many of our clients work from home part-time or full-time. The marketing services industry is not alone in this trend. According to a 2013 Forbes article, 30 million Americans work from home at least once a week and that number is expected to increase by 63% over the next five years. Working from home saves both employers and employees money. Employers report increased productivity and employees report increased job satisfaction. For additional facts, check out the great infographic at the end of this post on The Benefits of Employee Telecommuting. Set boundaries – avoid personal calls or household tasks during the workday. Take a lunch break – use this downtime to recharge and refocus. Dress for the job – wear work attire to provide a separation between work time and normal at home time. Have a routine – creating a work routine is important so that you stay on task. Remove distractions – keep the TV off and surround yourself with work-related things. If possible, dedicate a separate work area. Some experts further suggest listening to music without words and avoid sitting directly in front of a window. Working from home is not for everyone. But if you enjoy it, give these tips a try. My first day was fairly typical – paperwork, office set up, welcome lunch etc. However, up until that point, I had only worked on PCs. I likely spent the first day learning how to use a Mac computer. 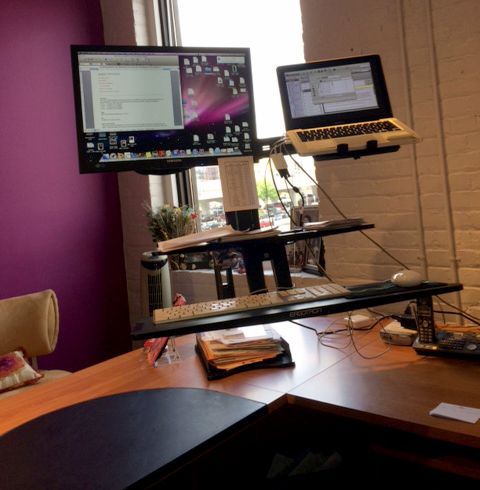 Last week I got a stand-up desk. My new desk attachment allows me to raise my computer and keyboard and stand up while I am working. If I don’t want to stand, I can lower it back down and work from a normal seated position at my desk. Why, you ask, would I want this? After all, it is a little clunky, takes up space and requires adjustments throughout the day. Here’s why. Most of us are aware that sitting all day long is not good for us. Back and neck pain and weight gain are what usually comes to mind. However, I was shocked to find out just how bad sitting for prolonged periods really is for us. Following is a list of health risks associated with sitting for eight hours a day: heart disease, over productive pancreas, colon cancer, muscle degeneration (weak abs and tight hips), foggy brain, strained neck, shoulder and back issues (inflexible spine and disk damage), obesity, leg disorders (poor circulation and soft bones) and increased risk of death from any cause. Wow. As someone who works at a desk job and spends about an hour and a half in the car daily, I was concerned. I had heard of stand-up desks or treadmill desks, but didn’t know much about them. Then my husband had one installed in his office and loved it. That’s all it took, I knew I had to have one. Take regular breaks. Stand up and walk every half hour. Sit on something that forces your core muscles to work. This could be an exercise ball or a backless stool. Alternate between sitting and standing. For example, stand up while talking on the phone, eating lunch or attending a meeting. If you are able to get a stand-up workstation – go for it. If not, follow the tips listed above to stay healthy. Mayoclinic.com, James A. Levine, M.D., Ph. D.
Some time ago I decided to take a break from social media on a personal level. As a non-digital native who gets plenty of screen time all day long, I was finding it increasingly harder to get engaged on my social networks during my down time. What started as a short respite, soon turned into an extended leave of absence. Let me apologize now for overlooked friend requests, dormant invitations to connect, missed party invitations, unacknowledged birthdays, and general lack of participation. Don’t get me wrong. As a marketer, I understand the power and potential associated with social media on both a personal and business level. Therefore, I pulled myself back into the loop. As part of my renewed commitment, I decided to conduct some research to find the latest best practices for LinkedIn. I found a good article on Entrepeneur.com that lists 17 must-have features for your LinkedIn profile in an easy to follow infographic.